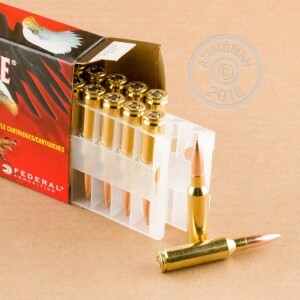 Whether you're testing a new barrel at a known-distance range or getting ready to turn over the odometer on an old build, you'll want quality ammunition that you can trust for accurate performance at great distances. 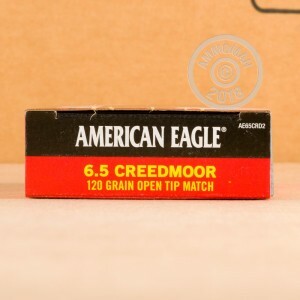 Each of these 6.5mm Creedmoor rounds is put together using a reloadable brass casing with a non-corrosive Boxer primer implanted at its base. This combination reduces long-term parts wear and leaves no barrel-chewing chemicals behind. The round is crowned with a very smooth OTM (open tip match) bullet that weighs in at 120 grains. This matches one of Hornady's original specifications for the 6.5 Creedmoor caliber and produces flat trajectories with relatively light recoil. OTMs are built by pouring led through the hollow tip of a copper jacket, preserving the bullet's outside measurements and smooth ogive while giving its inner core a complete structure with no air bubbles to disrupt its balance in-flight. This kind of quality work from Federal results in group sizes that you can cover with two fingers.